Which Dog Training Book is Best for You? While articles and forums can be useful to a new or experienced pet parent, nothing beats a book when it comes to knowledge. Besides meeting and working with a professional dog trainer, a book is one of the best ways to educate yourself about how to work with your dog. This list will go into detail about different types of books on the market, and explain who they may be better suited for. The end of each section will explain if this book is right for you and your dog, and they are separated into three different sections. Each book is either good for new puppy owners, owners with older dogs, or owners with experienced, trained dogs. While there are a lot of dog training books on the market, it is important to find one that is up to date on positive reinforcement and does not use negative reinforcement. Shaker cans, physical discipline, and shock collars are all outdated and proven incorrect methods. Take a look at these ten books that focus almost entirely on positive reinforcement and engaging with your dog in a fun and friendly way. Experience Level: This book is primarily for people with new or younger puppies. Host of the show “It’s Me or the Dog”, Victoria Stilwell is an expert on positive reinforcement dog training. In her book, she explains the importance of positive reinforcement as well as the detriments of alpha theory. She explains why the pack mentality is an outdated, and incorrect method of dog psychology, and gives good advice on how to teach your dog without using any forceful methods. The book then moves into a wide variety of solutions for common puppy problems, such as potty training, separation anxiety, and aggression. This is the third book that she has written, and the other two go well with this most recent book. All of her books focus on building a bond between the dog and the pet parent, rather than trying to control or force the dog into painful or fearful situations through physical control. Experience Level: This book is meant for people with younger puppies, or puppies that have a small amount of training. Jennifer Scott’s first book in a four part series focuses on all of your basic puppy training issues. Potty training, basic cues, teething and the like are all covered in the first part of this series. Without much filler like some dog training books can have, this series also focuses on building a powerful relationship between the pet parent and the puppy. With crate training, preventing jumping, and the whole slew of puppy problems that can arise very quickly, there is no reason to not have a guide like this on hand. With glowing reviews on all four parts of the series, Jennifer Scott shows her experience with a multitude of different dogs and situations, all while staying within the positive reinforcement style. The other books are worth taking a look at as well, once you have passed the basic puppy stage and are on your way towards full training. Experience Level: This book is for new puppy owners, or pet parents who need to begin training quickly. 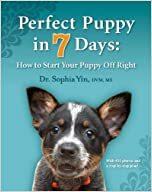 A book by Dr. Sophia Yin, this contains an extremely in depth guide for a week long crash course to train and work with your new puppy. While this book does have a great wealth of information in it, the guide is much more difficult to follow than some other books out there. This book does not skimp on any information, but require a great deal of discipline on part of the pet parent. 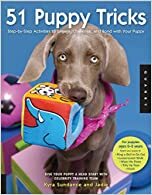 This book asks that you stay with your puppy almost uninterrupted for the full week, dedicating a great amount of time to the socialization and training during that seven days. The book does have an excellent way of guiding you through the day by day, but many pet parents who do not have the time to spend with a new puppy so thoroughly may not be able to to use this book to its full potential. Experience Level: This book is meant for people with younger puppies, or those who are having trouble training. 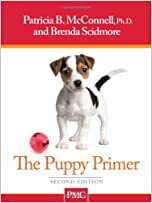 Written by Patricia B. McConnell, this book focuses on the importance of early training, but also takes a realistic approach about what to expect from a puppy as you are training. While many books teach cues and behaviors, this book also goes into what to ask for to get those behaviors, and when to expect to have a little more trouble. Dr. McConnell focuses on the differences in cues based on their location and surrounds, rather than expecting them to be done in a neutral environment every time. Focusing on staying positive like Dr. McConnell is important, and she explains when and how there may be times where that is more difficult. She anticipates when and where either the puppy or the pet parent may become stressed or overwhelmed, and provides reasonable, functional solutions for those situations. Experience Level: This book is good for any age dog, but especially for older dogs that may need more work and time to improve. Using a five-week program to help guide you and dog along a proper training path, this book begins to simple cues and needs before advancing to more difficult and in depth situations. The natural progression of his book’s guide from basic to advanced helps ease new pet parents into owning a puppy, even instructing and guiding through things like being calm at the vet and enjoying being around other dogs without any sort of aggression. Larry Kay, the author, uses all positive reinforcement methods to teach and guide puppies properly. He has trained dogs of several presidents as well. This book is not just for puppies, however, as he teaches how to work with adult and senior dogs as well, giving solid training advice for any age dog. By Karen B. London Ph.D. Experience Level: This book for people with adult dogs, or who need help with multiple untrained dogs. A fantastic, if a bit short book on how to train in a multiple dog household, this book is vital for introducing, training, and maintaining good relationships in a household with multiple dogs. Although it is a booklet and not a full book, it contains concise, useful information for anyone in a multi dog household. From possible aggression in playtime, to walking them all together on the leash, even to making sure there is no food aggression together, this booklet is perfect for guiding pet parents through the trouble of having multiple dogs. Teaching your dogs to be polite and ask for things, rather than pushy, is a big part of this training methodology and is proven to be extremely effective. Experience Level: This book is for pet parents with adult dogs, or people who may want a better view into why dogs think and act like they do before getting a dog. 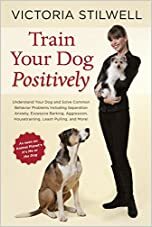 This book details not just how to train your dog positively, but also why it is important to train them using positive reinforcement. Unlike some other books that take you step by step, this book also includes a diary and training log to track how well your dog is progression in their training. 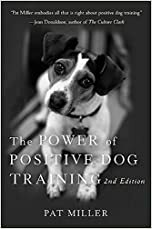 If you are looking for information as to why certain training methods work, and are interested in a more in depth look into positive reinforcement, this book is an excellent choice for you. 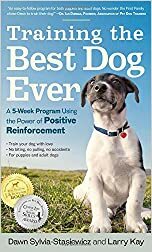 While many pet parents can be confused as to why positive reinforcement training works so well, this book takes the time to fully explain the science, thought process, and proof as to why it is the best form of training for dogs. Where some books do not touch on why other forms may not be as effective, this book is great at showing what to do and what not to do, as well. Experience Level: This book is good for puppies, adults, or people who simply want to read about stories of dog training to learn more for themselves. A book written from personal experiences by Tom Shelby, this book goes into detail about things pet parent misinterpret from their dogs, and how to properly recognize what your dog wants and needs. Shelby uses his own personal experiences with dogs in this book, using examples to both show problems that he has encountered, as well as the ways those problems were remedied. While this book does cover things that many other books go over, this one feels more personal than the others as you go through the scenarios with Shelby. The lack of clinical speak and guidelines may resonate better with some pet parents who enjoy a more personal approach to their training and reading, and all the methods in the book as positive as well. Experience Level: This book is good for puppies, adults, and senior dogs who have begun training and are ready for more advanced styles. This book is a wonderful overview and explanation on how to properly clicker train your dog. While clicker training is a more advanced type of training, with proper instruction you can teach any dog to appreciate and follow along with a clicker. This can aid in everything from basic potty training, to advanced cues like opening doors or turning on a lightswitch. 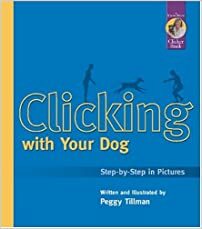 Peggy Tillman’s book on clicking is one of the best in showing the proper procedure, style, and benefits of clicker training. The Peggy Tillman schools are the top dog training schools in the country, and even offer basic courses to learn how to train your own dog, as well as advanced training courses for professional dog trainers. Experience Level: This book is good for any age dog, but especially higher energy dogs who know their cues and need a way to turn that into enrichment. This book focuses much more on the cues and tricks you can teach to your dogs, rather than a lot of the psychoanalysis and theory that some other books use. If you want a fun book to teach a well trained or well-behaved dog something new. These tricks and cues can be used both as playtime, or to help your dog burn off mental and physical energy to keep them happy and healthy. While these tricks may not be what someone who has a whining puppy or a semi-aggressive dog is looking for, they can be used in a wide variety of circumstances to calm or placate a dog by having them focus on something other than the stressor around them. Teaching your dog new cues is a great way to build a bond in between you and your dog. Deciding what book to purchase can be a tricky choice, but take into account your needs, your dog’s age and requirements, and what exactly you want to get out of the training. If you are struggling with basics, a puppy book is recommended, while a book about clicker training or tricks would be better suited for a dog who simply needs some more enrichment in their lives. Whichever book you do pick, just remember that positive reinforcement builds a relationship with your dog more than anything else, so keep the training happy and positive.